Pilates is a popular exercise routine that helps build core strength, flexibility, control, and endurance. Students are encouraged to focus on their alignment, breathing and movement coordination. The key positions and movements that form the basis of Pilates can be adapted by the instructor to suit beginners right through to advanced students. Pilates was invented by a German physical-culturist Joseph Pilates, at the start of the last century. It was developed after Pilates studied different forms of western and eastern exercise. Moves were inspired by his knowledge of gymnastics and from observing the natural movements of animals like swans and big cats. For anyone that does yoga, Pilates will be rather familiar, but with a far extended range of exercises, making it quite difficult to get bored of Pilates, no matter how long you’ve been doing it. Depending on what type of class you’ve signed up to, you’ll either being doing floor work on a mat or using various pieces of equipment, known in the Pilates world as apparatus. The ideal number of people in a class is 6. Anything more than 15 people per class should be avoided as you’ll want to make sure you’ll get personal attention from the instructor. The Pilates community has adopted six principles, namely concentration, control, center, flow, precision, and breathing (discussed further below) and as a beginner, you’ll spend your first few classes getting to grips with the fundamental movements from which more complex Pilates exercises develop. Basic moves include constructive rest, the head nod, arms over, angel arms, the pelvic clock and knee folds. Classes will end with various stretching exercises. While challenging, Pilates is a low-impact workout and although a little muscle soreness is to be expected after a session, nothing should hurt. In class, your instructor will be on hand to check everyone’s positioning during different exercises and offer advice. A good instructor will be able to modify different exercises to suit the abilities of each person in the class so that everyone benefits for the class. For people with limited mobility and range of motion due to injury or disability, Pilates can be a great form of rehabilitation, especially for people with back problems. The class will have all the apparatus you need, but if you want to practice at home it’s a good idea to buy a Pilates mat. Clothing-wise, you want something comfortable but fitted so that the instructor can check on your position and posture during different exercises. If you’re really committed you can find workout outfits specifically designed to accommodate the stretching and extended movements of a Pilates workout. The main piece of equipment used in Pilates is known as a reformer. It was specifically designed by Joseph Pilates and is essentially a raised, padded bench with resistance bands and springs that help you complete a variety of Pilates exercises. Pilates reformer benches are produced by a number of brands and are available for a range of budgets. For the truly ambitious there are other pieces of Pilates equipment you might want to check out, including the Cadillac, the guillotine tower and the barrel. 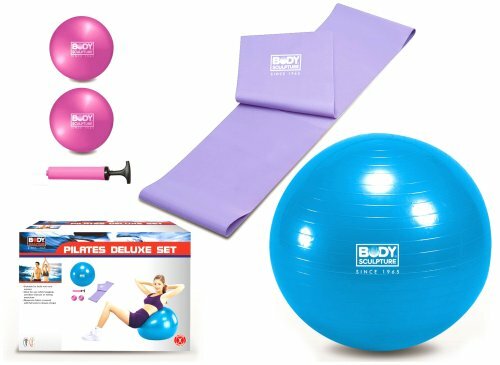 Body Sculpture offer an all-in one Pilates set at a very attractive price via amazon.co.uk – follow this link for many more options! Concentration: Pilates encourages students to learn to concentrate on their body, their movements and their positioning. Control: Control is an important aspect of Pilates and grows out of concentration. Every movement you make in Pilates should be a planned and controlled use of your muscles. Centering: Pilates teaches people to consider the centre of their body – namely the abdomen and lower back area – as the bodies’ powerhouse. All movements should start there and extend out to the limbs. Flow: Pilates also teaches people to use their body and muscles in an efficient way. Each movement should be precisely learned, after which a student will learn to flow efficiently through several movements together to build strength and endurance. Precision: Building on this principle, Pilates also consider precision to be important. It’s better to learn to do a few movements really well, than learn many but do them sloppily. Breathing: Like many types of exercise, good breathing technique is key to good Pilates form. People are taught to breathe in deeply from the base of their spine and to exhale fully from the same position. Pilates is one of the best exercise workouts for improving core strength, flexibility, and range of motion. While not a cardio workout, it certainly compliments one, and it’s particularly ideal for anyone that already does dancing, gymnastics or simply wants to feel fitter and more balanced mentally and physically.